I can't believe it! Mom and I, at long last, went to Mike's Kitchen after years of reading about its tremendous appeal on the Internet. I think the thing that finally got us to check this place out was when we read Michael and Jane Stern's review in their new book - 500 Things To Eat Before It's Too Late: and the Very Best Places To Eat Them. 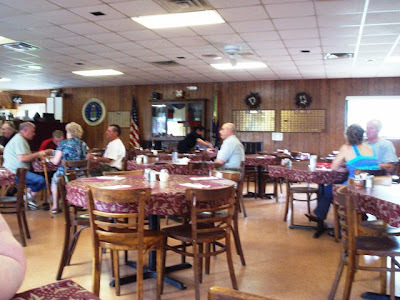 Mom and I have been using that book as a guide on where to eat in New England, and Mike's Kitchen - located inside of a VFW hall - topped the Sterns' Rhode Island list for authentic Italian food. 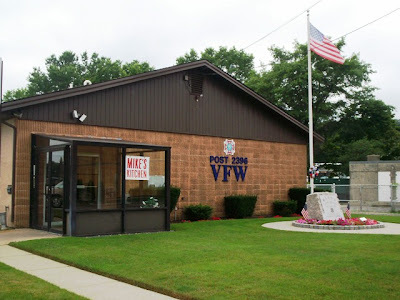 On a whim, we decided to call and see if it was open as they have weird hours because of all the different functions that the VFW hall has. To our surprise, they were open until 3 p.m. We quickly got into the car and took the drive to Cranston, arriving at Mike's Kitchen at around 1:30 p.m.
A small sign is the only distinguishing mark of Mike's existence! Definitely call to verify the hours ... just in case. 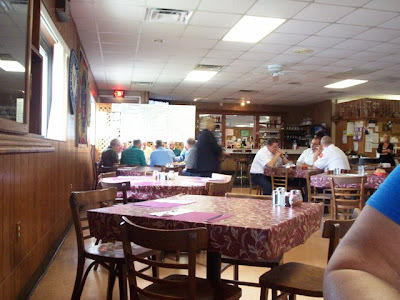 Once inside, Mom and I discovered that what we thought was a tiny room with a few long cafeteria-style tables was actually a very cute restaurant! A bit on the old-fashioned side, but we love that. Different awards and banners were scattered along the wood paneled walls, and a large board listing their daily entrees and specials was hung at the front of the restaurant next to the bar which serves beer, wine, and mixed drinks. The crowd was definitely made up of "regulars", and an added feature was that we could sit anywhere we liked (Mom loves that). We chose a table at the corner for ample picture-taking room and were soon greeted by a waitress who handed us two plastic-covered menus. She also reminded us to take a look at the large board for more options, and left us with a small basket of sliced bread with butter. A second waitress came to our table to take our drink order - two Diet Pepsis - which arrived in paper cups. Someone else came by and gave us two plastic glasses filled with water, which you don't really see anymore. We had to pay for the sodas in advance ($3 total), and were told that the money goes to the veterans. No problem. After a few minutes had gone by, we were greeted by a third waitress. My goodness! It wasn't that busy, so I don't know why the waitresses kept changing, but that kind of stuff doesn't bother us. We're just there for the food! Mom and I were still narrowing down our choices, so we asked for an extra minute. When waitress number three returned, we were ready to order. We both ordered entrees off of the board. Mom chose the chicken parmigiana with spaghetti ($10.95), and I chose the tortellini alfredo ($11.95). The waitress asked me if I wanted peas, so I said yes. 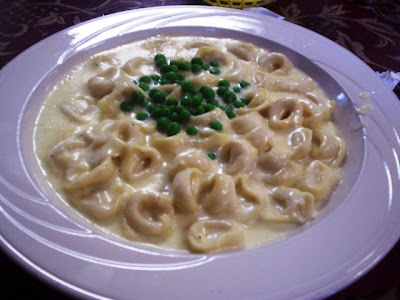 At this point, I wasn't sure if the peas were going in the alfredo sauce or if they were just arriving as a side dish. She took the menus away as Mom and I snacked on the bread, which was very chewy and delicious like most Italian breads are. We also sipped our soda and water, which had that funky Rhode Island taste. If you live in the area, you know exactly what I'm talking about - that oddly metallic twang. It really isn't pleasant, but the only way to avoid it is to provide bottled water/soda, and that can get expensive. While we were waiting, Mom and I noticed a sign that informed patrons that Mike's Kitchen does not accept credit cards. Very old school, but that could pose a problem for some people so make sure you come prepared with cash. Michael Stern described Mike's Kitchen as "a great seafood restaurant with a Rhode Island/Italian accent." Mom confirmed this when she told me that some of the menu items are very typical of an authentic Italian menu, and it's nice to know that Mike's incorporates local ingredients into their cuisine. Appetizers include antipasto ($7.95), snail salad ($10.95), clams zuppa ($8.95), fried squid ($9.95), and Italian ham, provolone, olives, tomatoes, and pepperoncinis ($7.95). Entrees include eggplant parmigiana ($9.95), veal cutlet ($13.50), Chicken a'la Mike ($14.95) which is their version of chicken cordon bleu, and shrimp scampi ($14.95). Pasta dishes include linguine aglio ($7.95) which is topped with garlic and oil, cheese ravioli ($8.95), and pasta with tuna ($10.95), squid ($13.95), clams ($11.95), shrimp ($14.95), and clams and shrimp ($14.95). Sandwiches include Italian ham ($7.50), veal and mushrooms ($7.95), sausage and peppers ($6.95), and steak ($8.95-9.95). They also serve Italian favorites - not really found anywhere I've ever seen - like tripe ($11.95), veal and mushrooms ($10.95), sausage and potato ($8.95), squid with tomato sauce ($12.95), sauteed squid ($12.95), polenta ($6.95-8.95), and a combination plate with eggplant, meatballs, sausage, and peppers ($9.95). Desserts include a nut roll ($2.50), spumoni ($2.95), and Bon Bons ($1.50 each)! Who serves Bon Bons anymore? That cracked me up. Please note that these foods were listed on their menu. 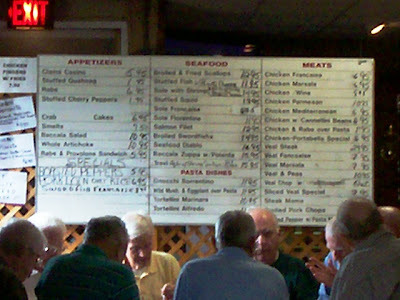 There was much, much more listed on their large board, including a whole artichoke for an appetizer ($10.95), and several dishes that included rabe, pork chops, and sole. A very, very different menu from the Italian places that Mom and I are used to. I couldn't get too close because of the large group sitting in front! When our food arrived, brought to us by yet another waitress, both Mom and I were surprised at how quickly we were served. Both plates looked great and were very large, and I finally realized that the mystery peas were placed on top of my pasta dish. Mom's plate was 90 percent covered by her piece of chicken, which was a huge breast that had been pounded flat, was nicely breaded, and topped by a delicious parmigiana cheese and fresh, homemade sauce. Mom said that the chicken was definitely the star of the dish. The coating was crisp, and the chicken inside was white and tender. Underneath the chicken was a good portion of al dente spaghetti which was also covered in that tasty sauce. 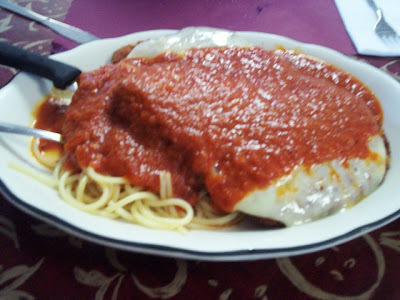 Mom informed me that this particular dish was now on her list of favorite chicken parmigianas. While there, she ate as much as she could, but ended up bringing home a large piece for Dad who devoured and thoroughly enjoyed it. Yes, that is one piece of chicken. My tortellini alfredo was excellent. Before digging in, I decided to sprinkle on some red pepper flakes that were available on every table. The bowl/plate that the dish came in was filled with tortellinis that had been stuffed with a tasty cheese. The alfredo sauce was warm, creamy, and tasted homemade. I wonder if Mike's makes their tortellini from scratch because I've found that most places don't fill the pasta that much. This dish did not disappoint and I finished every bit of it, but boy was I full. I'm definitely looking forward to trying a meat entree, because after tasting Mom's chicken, I am confident that Mike's knows what they're doing when it comes to good food. Not bad for two huge meals. Mike's Kitchen definitely does not skimp on the portions. We left $30 on the table which included a 20% tip, but we still weren't sure which waitress was going to be the receiver. Since Mom and I had a movie to catch, we decided to use the restroom at Mike's to cut down on time. We both found it to be clean and neat. Once again, a big thank you goes out to Michael and Jane Stern - and the many Internet fans - for recommending Mike's Kitchen. If you're looking for an old-fashioned, home cooked Italian meal with a Rhode Island kick, there's no better place to go. 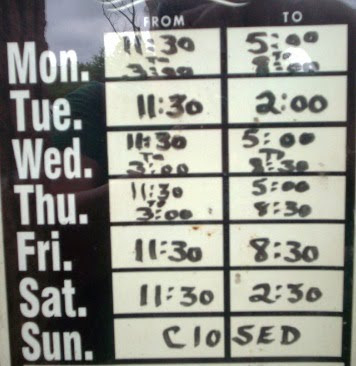 Please see the above photo for restaurant hours, and again, please call before visiting to verify these times. No one likes to drive for nothing - especially while hungry!